Place chocolate bar pieces in a microwave-safe bowl and microwave at 20 second intervals until melted (stirring after each interval). Combine tofu and pomegranate juice in a blender or food processor; process until smooth. Add cocoa powder, agave nectar, and melted chocolate and process until well-combined. Chill in refrigerator for 1 hour.Put mousse in piping bag or, if you don't have one, a zip-top plastic bag with a corner snipped off. 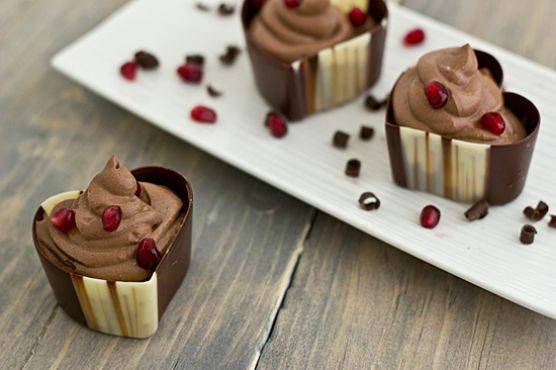 Pipe into dessert cups and garnish with pomegranate seeds. Mousse on the menu? Try pairing with Cream Sherry, Moscato d'Asti, and Port. A common wine pairing rule is to make sure your wine is sweeter than your food. Delicate desserts go well with Moscato d'Asti, nutty desserts with cream sherry, and caramel or chocolate desserts pair well with port.